We are proud to announce Matomo 3.3.0: the first public release of Matomo after we announced our new name! “Matomo” now replaces the name “Piwik” almost everywhere in the application. We’re going to continue renaming all projects, tools, Tracking SDKs, documentation, over the next few weeks. The release also ships with several minor bug fixes, as well as new features in Log Analytics. See the full changelog below for details. 53 tickets have been closed by more than 11 contributors! or contact the Business Support Team to make the most of your Matomo Analytics and get professional support (paid support). Please help us spread the word about Matomo! Maybe you can write about the project on your blog, website, twitter, talk about Matomo Analytics at conferences, or let your friends and colleagues know what is Matomo. Already 1,000,000+ websites have liberated their web analytics, and with your help we can grow the community! To improve Matomo in your language consider contributing to translations. Support our efforts by donating to the project. This release does not contain any major database upgrade. 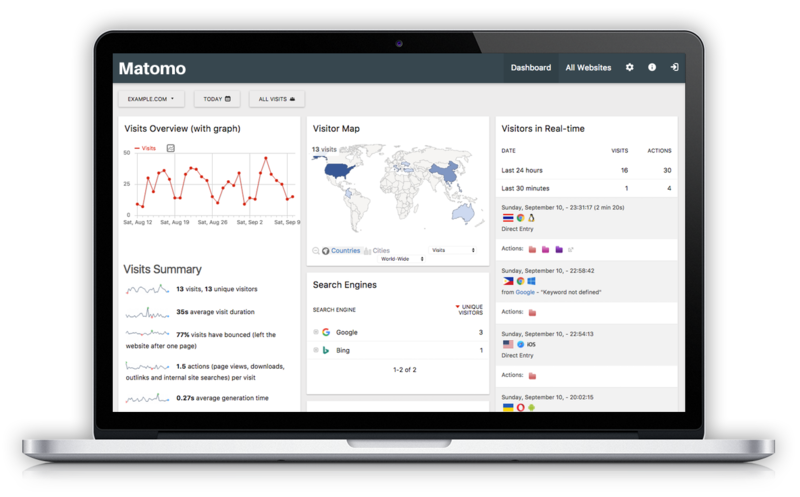 Matomo is an open analytics platform. In an effort to help Matomo developers learn about improvements and changes in the core APIs, we document the changes since the last release. In this 3.3.0 release there is a new HTTP API: API.getMatomoVersion. Read more in Platform Changelog for Developers to see all changes to the platform and APIs. Note: the Marketplace showcases more than 63 plugins already compatible with Matomo 3 but we think this is just the beginning. Matomo is your universal data analytics platform! Read the Updating Matomo user guide or for more help contact the Matomo experts. We are together creating the best open analytics platform in the world. You can help make Matomo even more awesome by getting involved in Matomo!